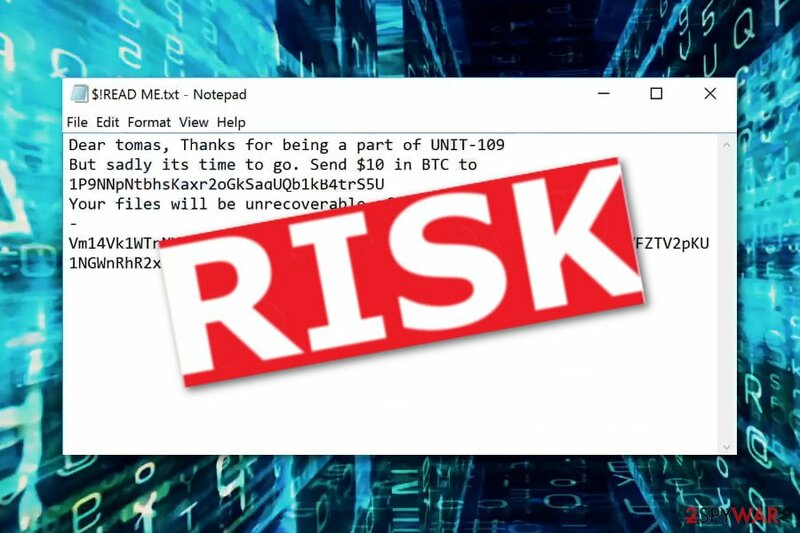 UNIT09 ransomware appears to be a file-encrypting threat which locks up important documents and demands a ransom in order to restore them. This malicious program infiltrates the system by using secret techniques, for example, spam email messages, infected hyperlinks, and files. .UNIT09 files virus starts the encryption process and locks up all data by using symmetric or asymmetric encryption. Furthermore, all files end up with the .UNIT09 appendix added. Once files are locked like this, they cannot be accessed properly anymore. As a solution, the cybercriminals offer an exchange. They present all conditions in a text message named “$!READ ME.txt”. The crooks demand a $10 BTC price for file decryption and give three days to pay the urged amount. If not, files will be permanently lost. However, we suggest not to rush and not to trust the developers. Even though the price is very low, we still advise avoiding any contact with the cybercriminals if possible. They are very likely to scam people and run away with their money. 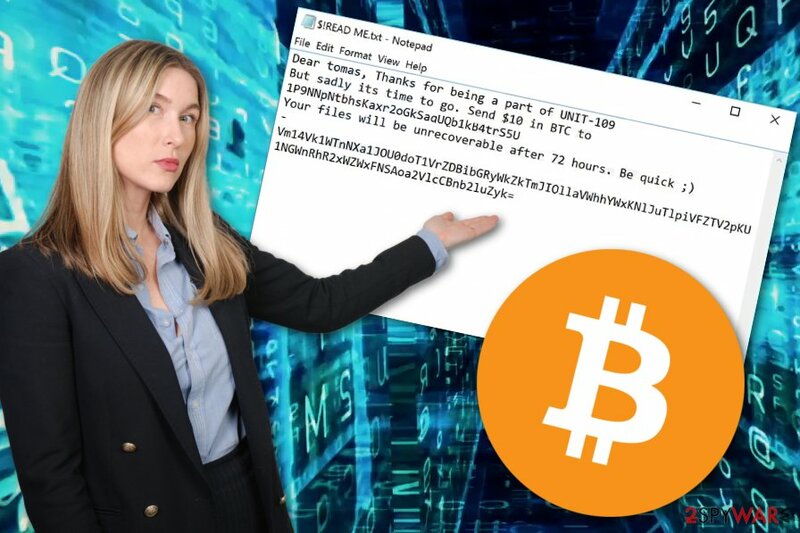 Instead of paying the demanded ransom, you should remove UNIT09 virus from your computer system automatically. We suggest using specific computer tools to detect all malicious content in the system. For this, try Reimage. After you perform the UNIT09 ransomware removal, you can take a look at some data recovery techniques we have displayed below the text. Even though crooks who create and spread ransomware viruses use unique and hardly-identifiable keys that lock up files, that does not mean you should not try to decrypt them by using other tools. However, keep in mind that you need to terminate the ransomware virus first before you carry on with the file restoring methods. Moreover, UNIT09 virus might bring other unwanted consequences also. Some of these dangerous infections are capable of permanently erasing Shadow Volume Copies of locked documents. Others have the ability to inject malware programs and make the system even more vulnerable to various infections. Because of these reasons, you should get rid of the cyber threat as soon as you spot encrypted files or the ransom note on your computer's desktop. Once UNIT09 ransomware infiltrates the targeted computer system (this mostly happens to Windows desktops and laptops), the dangerous cyber threat injects dubious registries straight into the Windows Registry section. Moreover, .UNIT09 files extension ransomware can place unwanted and hazardous files in different locations of your system. All of these components need to be terminated if wanted to get rid of the computer infection for good. Ransomware usually is brought from rogue email messages that crooks send to random users. You can usually find such letters in the spam section, however, in some cases, the infected letter might fall in your inbox section too, and this is the main reason why you need to be so cautious. Before opening any unexpected email message you should investigate it closely. First, check the sender and its email address. After that, measure the risk and your expectations, were you waiting for anything important recently? No? So there is no reason of opening the message, better delete it permanently. However, if you have checked the email from all sides and it did not look suspicious to you, you can open it and search for grammar mistakes. Crooks often leave mistakes in their message texts which lets the victims doubt the legitimacy of such letters. However, even though if the message does not contain any grammar mistakes, we still recommend avoiding opening any attached files or links as it also might be a trick. 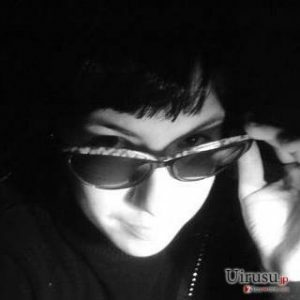 Some cybercriminals pretend to be from reputable organizations and trick users this way. According to cybersecurity experts, ransomware viruses should be erased as soon as possible as these cyber threats might bring unwanted consequences to the user and his/her computer. Remove UNIT09 virus by using automatical computer tools only. Manual elimination is not a possibility in this case as the virus might be too hard to get rid of on your own and you might do just more damage to the computer system or its components. UNIT09 ransomware removal should be performed after detecting all malware-laden content in the system. We recommend using tools such as Reimage, Malwarebytes MalwarebytesCombo Cleaner, or Plumbytes Anti-MalwareMalwarebytes Malwarebytes to find all malicious components in the infected system. Furthermore, do not forget to perform some system backups, activate the Safe Mode with Networking function, or disable the virus activity by using the System Restore feature. Log in to your infected account and start the browser. Download Reimage or other legitimate anti-spyware program. Update it before a full system scan and remove malicious files that belong to your ransomware and complete UNIT09 removal. When a new window shows up, click Next and select your restore point that is prior the infiltration of UNIT09. After doing that, click Next. Once you restore your system to a previous date, download and scan your computer with Reimage and make sure that UNIT09 removal is performed successfully. Guide which is presented above is supposed to help you remove UNIT09 from your computer. To recover your encrypted files, we recommend using a detailed guide prepared by 2-spyware.com security experts. If you have found some encrypted files on your computer, do not rush to contact and pay the crooks. Take a look at these below-provided data recovery steps. Use this method if you want to recover some of your important files. Note that this method works only under one condition – you should have enabled the System Restore feature in the past. Sadly, no UNIT09 ransomware decryptor has been released yet. ^ Christina Mercer . What is encryption?. Tech world. About cybersecurity. ^ Tim Fisher. What Is the Windows Registry?. Lifewire. Independent news website. ^ Phil Goldstein. The 3 Main Ways Ransomware Spreads in 2017 . Biztech magazine. Articles. ^ Dieviren.de. Dieviren.de. Virus removal guide. This entry was posted on 2019-02-01 at 05:10 and is filed under Ransomware, Viruses. You can quickly scan the QR code with your mobile device and have UNIT09 ransomware manual removal instructions right in your pocket. How did you remove UNIT09 virus?